So I did finally get to try the White Asparagus at Zum Schenider last weekend. 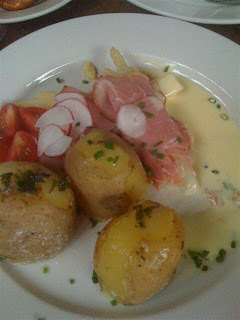 It came wrapped up in some Ham with some boiled Potatoes. The dish was pretty good but look at how tiny the stalks were! I was expecting some of the big guys like we had in Munich. I guess we can't get those shipped in here. However all of the other food we had was awesome and Zum Schneider continues to be my favorite place in the city to chill with some big beers and while away the night. God I love that place! I was so excited to go to Zum Schneider on Sunday to get some big beers and try their white asparagus. We made plans to meet up with friends right at 3:00 for some eats. I practically ran there in the oppressive muggy heat only to find it completely shuttered and a sign on the door that said they wouldn’t be opening until 6:00. WTF- I checked the website and everything before coming. Now I was dripping with sweat and starving. We needed something to tide us over. I wasn’t waiting 3 more hours before eating. So we rerouted over to Grape and Grain and ordered up some of their Brunch specials to share. 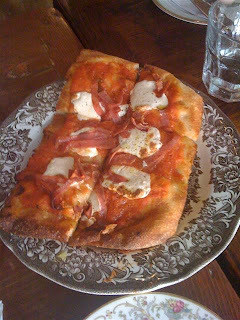 The best dish was the Prosciutto, Salami and Sopressata Pizza. Wow this pizza was packed full of flavor. It had a slightly sweet chunky tomato sauce on top that really went wonderful with all of the salty meats. The edges of the pizza were golden brown and had a fantastic buttery crunch. Yum!!! Our next pizza we ordered was the Breakfast Pizza. Saturday turned into a beautiful day so Mr. T and I did some wandering around of eating and drinking. 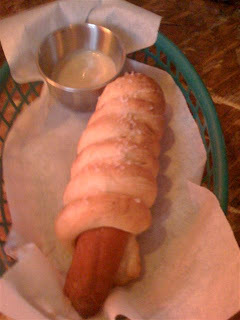 First stop was The Rusty Knot for some beer and their Pretzel Hot Dog. For some reason I thought the Pretzel would be baked on the Hot Dog more, fully encasing it. Here the Pretzel was twisted around. It was pretty good but not as good as it sounded at first. Two thumbs up however for having Busch Beer on tap! That brought me back to my High School days! Lol! Then we headed over to The White Horse Tavern to watch the Yankee game and drink some more beers. The White Horse is most famously known for being the place Dylan Thomas drank himself to death. The White Horse is famous in my book for having solid pub food at rock bottom prices. It was quite a sizable piece of meat with a nice char on the outside and a toasted bun. It came more well than medium rare but it still had a nice juicy inside and lots of flavor (although I would have preferred that red middle). Mr. T and I finally tried Veselka last week. When I first moved here I heard they had Borscht and I was dying to try it. Borscht is something my Grandmother used to make every year at Christmas and it was truly one of my favorite dishes of the night. I've had it before at the Russian Samovar and I really didn't care for their version. I was hoping Veselka would be different and luckily it was. Look at this beautiful color! This Borscht was so wonderful! It had such a rich beety texture and flavor that was absolutely delicious. I was so content slurping away happily with my soup. This is what true comfort food is- eating something that reminds you of home. I felt like I had just gotten a big hug. We decided to split some entrees and first up was the burger. Veselka is a highly underrated burger. The meat was perfectly charbroiled with a nice salty crunch on the edges and an incredibly moist inside. Saturday night was the main event of the weekend. The dinner to celebrate the impending nuptials of my friend. It had only taken me four hours of constantly hitting the redial button over and over again, 30 days in advance to score a reservation at Babbo. We had been here once before on Father’s Day for Mr. T’s dad and I just fell in love with the food. I was hoping tonight would be no different. We got there right at 7:45 and were lead to a table in the elegant upstairs which I had requested. We started with a round of Prosecco to celebrate and then we moved on to a nice bottle of red. We all wanted to try as much food as possible so we just decided to share everything. We picked 2 appetizers, 2 pastas and an entrée for two. My friends were in town last weekend for a special bachelorette weekend. After hitting up the Yankee game Friday night we awoke Saturday morning in need of a solid brunch. I wanted to try something new so we headed over to Kellari Parea, a Greek Bistro near my apartment. We got there right at noon and were the first ones there. Not even the jazz band had set up yet. We sat up front near the nice big windows that let the sunlight stream though. Each breakfast came with a drink so we got a Mimosa, Bloody Mary and glass of Champagne. I was psyched. I was loving the atmosphere, the drinks, everything. This place had the potential to be awesome I thought. And it could have been! If it wasn’t for a few big problems. But I’ll get to that. After we ordered they brought out some bread and a little plate filled with olives, radishes and hummus. The hummus was pretty good but a little bit too garlicky for a morning start. Just some things I've been doing lately that I cant write a whole long post about. Inoteca Liquori- love the space. Food was awesome as well. The octopus, prosciutto and affordable bottles of wine will keep me going back. The service could be a little tighter but it is about 10 times better overall than Bar Milano. Bespoke Chocolates- This is quickly becoming one of my favorite chocolate stores in the city. The French Milk Chocolate Bon Bon and Pretzel Carmel Delight are to die for. Plus the woman who owns it is super friendly and truly seems to love what she is doing. I really hope this place makes it. Wildwood BBQ- got the cheeseburger here and can't understand all the fuss about it. It was okay but nothing special in my book. However they continue to have a great selection of beer and nice open windows in front so that makes it a nice place to stop and grab a drink. Before we left for Europe we went to the second home Yankee game of the year. I got there early to check out the new stadium and specifically the food. 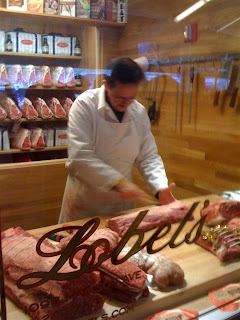 My first stop was Lobel's for some meat. Look at him cutting up those huge pieces of meat! They make every sandwich to order and then pour a nice au jus right on the top. Nice!!! Here's a picture of the $16.00 sandwich. Bite already taken out of course. The sandwich was huge and very fresh but for $16.00 I wasn't blown away. The meat was very tasty but it was almost a little too rare. Mr. T and I both had trouble even biting into the thing because the meat was so chewy. We decided to supplement our sandwich with some fries and a cheeseburger from Johnny Rockets. The fries were surprisingly crispy and fresh as well! Much better than the old Yankee stadium fries. The burger was pretty good as well. It had a lots of toppings so I couldn't really taste the flavor of the meat but after a couple of beers this is a tasty option. Markt used to be one of my favorite places to dine in the city when it was still on 14th street. I loved the wonderful corner space and the sleek long bar where it always felt busy and exciting. Not to mention the food! Markt moved closer to us a few years ago on a busy, somewhat noisy area on 6th avenue. We had only been there once since they moved and sat inside. Yesterday we happened to be at Best Buy right nearby so we deiced to try out our old favorite again. 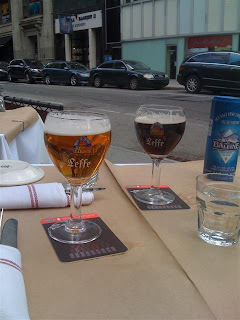 We ordered up a couple of Leffe’s (a blond for me..I still haven’t been able to look at a Leffe Brun since my illness in Brussels) and grabbed a table outside. We weren’t starving so we decided to forgo any appetizers and just went for some mains. I ordered the Rai au beurre noire et capers. In other words some steamed skatefish with lemon, capers and brown butter. Wow there was a LOT of butter in this dish. The fish was incredibly moist and had a nice flavor from the lemon and capers but the butter was a tad much. I happened to be in Bayside for work the other day so I called up my friend Lynch (who lives in bayside) to see if he wanted to meet up for drink. We had both just gotten back from vacation and were having a hard time getting back into the swing of things. A little beer always helps that! We started out sitting outside of Press 195 and then decided to move over to Donovan’s once it started to get chilly and had a seat at the bar. I have always wanted to try a Donovan’s burger since I heard they were fantastic. However I had just had an enormous lunch and didn’t think I could do it justice. So instead we decided to get an order of their mini burgers to share. Look how cute they came out with the little olive on top! 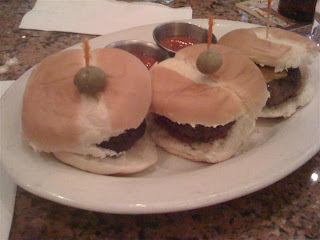 MMM…These mini burgers were good! The patty itself was thicker than most mini burgers, and although it was cooked a little bit more than my liking, the meat still retained a ton of juice and had a nice overall flavor. I’m going to go through Munich pretty quick. To be honest it was probably my favorite place on the vacation but I’ve been home a couple of days now and recounting every detail is making me tired and a little depressed. We got into Munich right around 7:00 and checked into our hotel without a hitch. Dinner was at the Weinhaus Schneider. They offered us English menus and we set to ordering up two huge plates of grub. First they started us with a huge salad for the table and some bread. Then came our entrees- Mine was the Bacon wrapped Pork with Noodles (spatzle actually). My dish was only so so. I was expecting more flavor from the pork. I had read that the pork here was the best and this really didn’t have much taste except for the heavy gravy. Mr. T’s dish was much better the Sauerbraten.